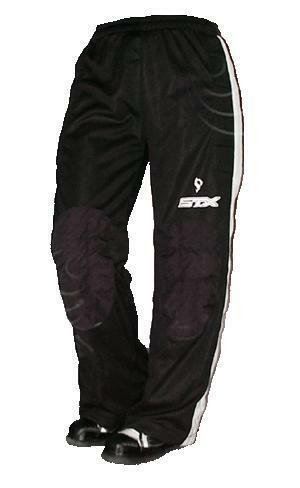 Nylon twill mesh fabric that "breathes", wide leg design and VERY THICK KNEE PADS for extra protection and wear. Elastic waist and drawstring improve comfort and fit. 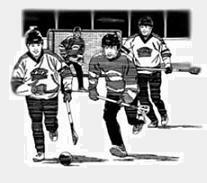 Specially designed for broomball and other contact sports. Knee and shin pads easily fit under the pant leg still allowing exceptional player mobility and comfort. Players should be over 6'-0" tall or have long legs for the pant length to be acceptable. Made in Thailand. Adult Large 33"-37" 31" 43"
I'm happy with my purchase. Pants are a little baggy around the ankle but the reinforced knees and padding on the hips are great. 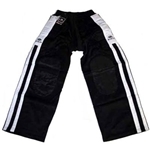 The pants are a very think layer of a mesh material so they breath great. If you hold them up the light you can barely see the light come thru. Like I said ... all in all a good value for a broomball pant. These pants are single layer MESH... as in one layer and you can see thru them. Would not recommend if using outdoor. Also, the knees are reinforced (kevlar/cordura type material) but NOT padded. The only padding is along the hip. Lastly, the legs are loose and baggy (as advertised) however still much larger than I anticipated. The leg open easily covers my entire size 10.5 boot. Definitely need to tape the open to keep the pant leg from dragging. 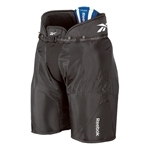 Overall, may be useful as an indoor pant over a pair of shorts, but worthless for outdoor play in even mild weather. 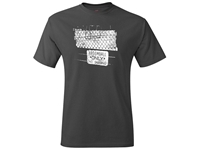 I also question the durability of the single layer mesh.